There are two things you need to know before you read any further. Firstly the fortwo has two seats and secondly it has an official range of 96 miles which translates into somewhere between 50 and 90 miles in the real world. If either of these points are an issue for you, stop reading now. So if you are reading this bit we can assume that limited seating and range aren’t a problem for you, so what else do you need to know? 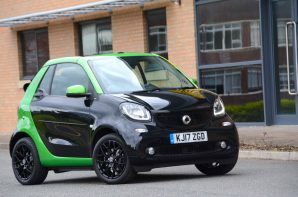 Well this is the fourth generation of electric fortwo with a trial fleet launched in 2007 smart has had a while to finesse the technology and with battery supply coming from a Daimler subsidiary and the motor hailing from Renault the key components have provenance. On the move the EQ is the best fortwo to drive. It is superbly suited to the urban environment for which it is designed. The compact dimensions and instant torque make nipping into gaps in city traffic a breeze whilst the stunning turning circle provides a get out of jail card if you end up down a dark ally. The short wheelbase, rear weight distribution and regenerative braking acting through the rear wheels also enable a lively balance at higher speeds which is much more interesting than the terminal understeer you tend to get in City Cars. The interior is standard fortwo which means well designed, interesting to look at and well appointed. One big surprise however is the lack of any adjustment on the steering wheel. Given the petrol fortwo allows height adjustment we can’t quite work out why this isn’t possible on the EQ. Depending on your height this could be a make or break issue so make sure you have an extended test drive. Given the limited range it is good to know that you can pre heat or cool the EQ whilst it is plugged in to the mains, there is also a very effective ECO mode which does knock back performance noticeably but also delivers a big improvement in range. It is also laudable that smart has provided both an analogue battery charge gauge and an electronic one both of which are very clear and tell you battery charge to within 1%, so if you do run out there are no excuses! The onboard charger now accepts 7 kW allowing home recharging to be maximised, 22 kW charging is on its way but isn’t available yet. The small battery makes this less of an issue than most EV’s but it is worth knowing if you do need quick charge capability the ED won’t be on your list. Other issues include a very firm ride and a lack of regenerative brake settings so you either have to have it set to maximum or use a radar based system neither of which are ideal. The fortwo ED is fun to drive and brilliantly suited to urban running. The Cabrio is more expensive than the Coupe ED which means that the smallest convertible on the market does come with a hefty price tag. It is also a shame that smart couldn’t have eked out more range the combination of limited and range and high price tag does make the EQ a niche proposition, but if it meets your needs there is much to like.